A community of artists and craftspeople in and around Bellevue has been churning out a broad array of work for many years. Creative work from the south valley often finds its way to homes farther north in the Wood River Valley. Bellevue's first Open Studios Tour last weekend drew about 200 art-curious locals and tourists to "the silver town with a golden heart" to see where Bellevue artists work, and to learn a little about the people behind the art. The self-guided tour on Friday and Saturday featured 11 artists. Their work ran the gamut from abstract paintings to landscapes, photography, sculptures and functional iron and concrete work. Local restaurants and bars participated with special deals on food and drink. The tour was centered around the Green Antelope Gallery on Elm Street where Brooke Bonner represents most of the artists, along with a dozen or more other artists from the region. She said the tour was meant to add something that other gallery tours in the valley don't provide. "To actually go to artists' studios allows you to get to know them," she said. "It's much more up-close and personal." On Saturday evening, dozens of people wandered through the Green Antelope on their way to artist studios in downtown Bellevue, on Broadford Road and farther south in the Bellevue Triangle. About 200 people walked, biked and drove from studio to studio. They were met with bonfires, refreshments and conversation along the way. Some came to look, some to buy and others to learn about the process of art making. By Sunday, several art pieces were sold and a few commissions begun. "We kept hearing about this idea from different sources and decided it was time to do this," said Bonner, who is also a fine-art photographer. "People were very excited with the number of people who came through." 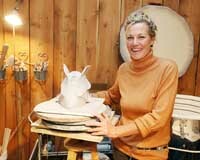 Sculptor Sarah Long treated visitors to a tour of her do-it-yourself pottery-painting "Bella Cosa" studio on Elm Street. Long makes lightweight figurative sculptures. "Bronze can be so expensive," said Long, who was happy to describe the mold-making process behind her work. Long has modeled at least one of her bronze mermaid sculptures on her charming daughter Bella's good looks. "Yeager's Acre," a few miles away on Broadford Road, is the home of Don and Laurie Yeager. Don has collected hood ornaments from classic cars for more than 30 years. Lately he has incorporated them into steel sculptures that simulate flight. Yeager's art reflects a passion for cars and for travel. He has acted in troupes from Sun Valley to Tahiti and built one of the first mid-valley homes in what is now Weyyakin subdivision south of Ketchum, from a giant wooden wine cask. He is currently at work on a memoir, "Born at the Right Time." Perhaps he will finish it this winter at his and Laurie's southern base in Los Barilles, Mexico, on the tip of the Baja Peninsula. FourStroke Bus front man Wade Port played music with Yeager at his studio during the tour, in preparation for a CD release party on Friday in Sun Valley. The heavy-duty artistic steelwork of Mark Sheehan is in many homes in the Wood River Valley. It can be easy to take for granted the kind of effort that goes into pounding out metal fireplace screens, stairways and fences, until you pay a visit to his studio. Dozens of sledge hammers and other tools hang beside heavy machinery and torches. "Three years ago I had quite a bit of competition. Then it just dropped off to nothing," Sheehan said. "Business is starting to trickle back. Hand-crafted materials will never go away because they are irreplaceable." Kirsten Shultz's photography was on display at her studio on Main Street, upstairs from The BrickHouse Restaurant, including work from Paris and New Orleans. She saw a steady flow of people all weekend. "I loved having the studio open because I usually open by appointment only," Schultz said. "It was great to be able to have an event like this, to see people walking around off of Main Street." Martha Andrea lives on Equus Loop in the Bellevue Triangle. Viewing her work in a gallery, one might not know why her paintings always feature birds. At her farm and studio, she has a living avian collection that includes a parrot, a dove, a peacock and chickens. She recently adopted a wounded magpie and she also has a raven. Two artist couples participated in the tour this weekend, showing how to create in a yin and yang manner. Steven and Janet Houts welcomed the public into their side-by-side studios on Elm Street. They moved to the area a few years ago from California. Steven was asked to provide a mask for a Burning Man-style celebration last winter in Croy Canyon, which was attended by hundreds of people. "I still go back to Santa Cruz regularly to surf," said Steven, who combines handmade paper, willow sticks, brass and other materials into his sculptures. "I have more art here than anyone should have. But I guess that's what happens when you don't have to sell your work to make a living." Nolina Burge and Cliff Frates moved to Muldoon Canyon this summer from Los Angeles with two small children. Cliff, an abstract painter, is creating a mountain landscape out of blue painter's tape on his garage wall. Burge is known for painting highly detailed landscapes on aluminum. "We both enjoyed the studio tour," Frates said. "And we like Bellevue very much. It's great so far, but ask me again in the middle of winter." Backcountry guide Pamela Street, who also lives in the Bellevue Triangle, welcomed many people into her home studio over the weekend to see her plein-air landscape paintings of the local environment. Street said she was inspired by visits from other artists, who shared ideas about their own work as they passed through her place. Marie Stewart lives and works at the high point of Griffin Ranch south of Bellevue. With a commanding view of the south valley, Stewart draws inspiration from her native Australia. Hundreds of brightly colored paintings, mats and pieces of apparel hang in her home. Her work is a celebration of color and whimsy. She is one of several artists chosen recently to contribute design details for a new rodeo arena being built in Hailey. "I want to experience another dimension of reality," she said. "Not with drugs or alcohol, but just through inspiration." A tour of the creativity in Bellevue can provide just that sort of thing, a feeling that there is something else out there beyond our day-to-day experience of life. Artists can do that if you let them. The tour also helped to bring the artists of Bellevue together before the long winter sets in. "This was a great experience for us," said Janet Houts. "Having people see our process helps explain who we are and what we do. It was also an enriching experience for us to explain our work. It validates us as artists. "It helped to bring us together as a community of artists, because we are often isolated from one another. We felt connected with one another afterward and that was something we had not foreseen."